Voiceovers today are recorded anywhere — from remote news locations to acoustically-treated sound studios. How one sounds in a voiceover, whether as a news reporter or a professional narrator for documentaries, determines the commercial success of the performer. Beyond the technical set-up, there are some tips that every one that does voiceovers should follow. Voiceovers create the signature sound of the performer and often determines the future success of news reporters and documentary makers. How one sounds can be critically important in the success of a film. The art form also extends to producers of all kinds, who must match the right voice to the narration their story. Sweetwater Sound, the pro audio dealer based in Fort Wayne, Indiana, advises clients on the set-up of voiceover booths and facilities. However, Sweetwater says the individual voiceover artist must bring some skills to the session beyond their natural voice talent. Here are some tips that Sweetwater recommends for voiceover talent. One is to maintain good posture. If possible, stand to read copy. If not, sit up straight. Good posture helps maintain breath support, which makes it easier to speak in a strong, clear voice. Voiceover artists need to stay hydrated during the recording session. A drink should always be close at hand. Water works very well, either hot or room temperature. If the mouth gets dry, the voice will make noises — smacks, clicks and pops — that will distract from the message. 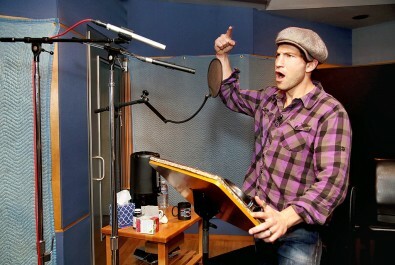 John Bernthal recording voiceovers for Call of Duty in Los Angeles. Professional voiceover artists know that speaking is not the same as talking. Though talking is natural, “speaking” into a microphone is unnatural. When talking to another person, one not only uses the voice, but also facial expressions, body language and gestures. These are all things that help to be fully understood in a face-to-face conversation. But this does not translate to voice-overs. To make sure that each word is understandable, clear speech is essential. Don’t speak so quickly that words slur together, nor so slowly that it puts the listener to sleep. Before beginning a voiceover, warm up the voice. Read the script aloud before starting the recording. This allows the voiceover to find the right combination of volume, projection and pacing. 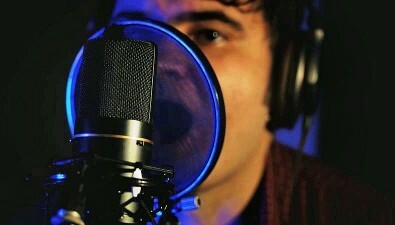 Then stand eight to 12 inches from the microphone (to avoid proximity effect) and begin. Good writing is not necessarily easy to read. A paragraph that is written well — one that is concise, understandable and informative — can be challenging to read aloud. The only way to know is to actually read the script aloud in advance to see where the difficulties lie. Find a way to bring clarity to those difficult sections by inserting pauses to break up a hard section or, if necessary, by changing a sentence or even a single word if that solves the issue. Reading and marking up the script in advance can remind the reader where to breathe, when to pause and even when to pitch the voice lower or higher for emphasis. The goal is to make the voiceover sound natural, comfortable and appropriate for the content. If a mistake is made in the reading, pause for a couple of seconds. Then, back up a sentence or two and begin reading again. Those pauses will give the engineer a visual cue when editing the voiceover for broadcast. To keep the editing process as clean as possible, always stop and take a breath before reading is resumed. Amateurs will frequently talk right up to the first word of the “read,” and that makes it difficult to get a clean edit when assembling sections together. Of course, there are some technical things any voiceover artist should learn in advance of any recording session. One is to be aware the kind of microphone sounds the best with your voice. Men and women have different voices and certain microphones suit each better. Some people sound best on large-diaphragm condenser mics, while others sound best on a dynamic mic. Be aware of the mic your voice is best suited for. 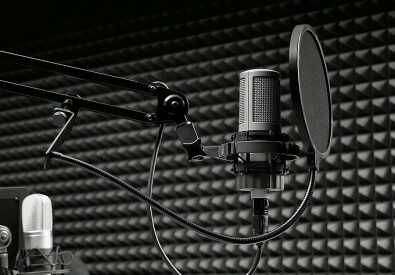 Many successful voiceover artists own their own microphone and bring it to sessions. If you have a tendency to make plosive sounds when doing a voiceover, always use a pop screen. Placing the pop filter four to six inches in front of the mic insures the right distance. It is amazing these days how many voice narrations are marred by the popping “p” and are never fixed. I have been told by prominent artists, including singers, that finding the correct studio set-up for them can be very difficult. Most of the truly successful artists know their signature sound and come to the session knowing their requirements for what makes them comfortable and sound good. If your success depends on the quality of a voiceover, don’t entirely depend on engineers or technicians to get it right. Recording facilities are not always perfect and engineers may not know the intricacies of each voice. Come prepared and know your sound in advance.